Band of Dystopian (BOD) is a Facebook group, blog, and company dedicated to dystopian, apocalyptic, and post-apocalyptic books. Our mission is to help fans of dystopian fiction find books they will love and help authors of the genre get the word out about their work. Our community of over 2,700 readers and authors has become a supportive, interactive, and insanely fun place to be. 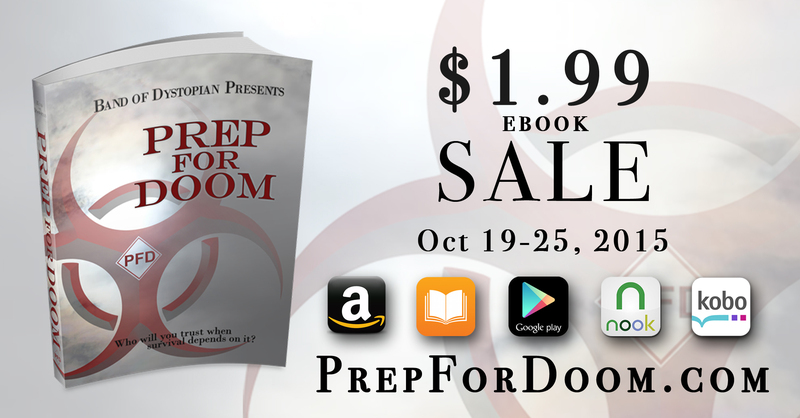 We are branching into the publishing world with our first anthology, Prep For Doom. We have over 200 authors in the group, plenty of great conversation, tons of giveaways, and the perfect place for dystopian lovers to find their next great read. What a ride! It took a minute to adjust to the concept of authors changing each chapter, to a different story line spinning an intricate web. But once you remember that, and it doesn't take long, it is simply amazing! You get so many different "real feels" because they are coming from different people who feel and look at things differently. Kind of mind blowing when you sit down at the end and think about it all. Very deep. Left me reeling for days. Contemplating it all. Wondering what happened next for the different characters that you connected with. Characters that you loved instantly, and despised equally. You really see the true side of humanity. The good who want to survive and help others, versus the power hungry who want to take and hurt people to only save themselves. Deep and thought provoking, and kind of sad. I definitely had my favorite stories and characters, but all the chapters were really good. There were some chapters that left me really wanting more, and I will be going out in search of some of those authors books. I loved how here and there two stories will cross over just a bit, and you get a little hint of more information about what happened next for some characters. Once again BOD hits you from multiple angles with their greatness! An amazing story that leaves you pondering for days, introductions to multiple talented authors, to give you a taste of all their different writing styles, and another taste from authors we already know and love :) A compilation of greatness!